Speaking of which “healing dogs”, aralez/haralez are not unique to our culture. They can be found in many cultures among which, Greek Egyptian, Assyro-Babylonian and beyond. Observe below how our sun god Ara connects to the Egyptian sun god Ra. It has been shown by some Orientalist- Armenologists in a number of quotations of mythological and historical datat that the native people of the Armenian Highland and the neighboring regions of Asia Minor had, in the earlier periods of paganism, a deity whom they called AR or ARA. In the primitive hunting stage of the life of these natives, the god ARA possesed animal-vegetal charactheristics. Later, with the beginning of agriculture, he acquired a vegetal-solar nature and with the development of irrigation in agriculture and the consolidation of statehood, he became a great war-god and was identified with the sun. This process of change from primitive to complex characteristics, as manifested in the nature of AR(or ARA), is by no means unique in the mythological history of mankind. It has had its close parallels. For example, the god Assur,in the earliest periods of the founding of the city of Assur, had a vegetal (peaceful) nature, but later on, when Assyria became a mighty empire by bloody expeditions, it turned into a fearsome deity and was identified also with sun. Research has revealed that inthe remote past AR (or ARA)was the principal national deity of the Armen people. H.Matikian, N.Adonts, M.Abeghian, G.Ghapantsian, and ohter Armenologists accept that ARA was the native deity of the Armenians. The known Orientalist A.H.Sayce states that AR was the sun-god of the Armenians. In his words:"...it is better to suppose that ER,or ARA,was an Armenian name for the Sun-god, which in later times was confounded with Arios (Nergal)of Ktesias." In this connection H.Matikian writes:"To study ARA the Beautifu means to make inroads into the obscure centuries of the origin of the Armenian people and to examine them." It is not unlikely that those of the third millenium B.C. could have Sumerian origin derived from the plural form -e-ne reserved for persons) of Arma-ni (or Arme-ni), as has been mentioned earlier, is plural and toponymic suffix (cf. Mitanni, Supani, Alzini 'Alzinini', Daiaeni, Nihani, etc.). Hence Armani (or Armeni) means 'sons of Ar', that is, 'sons of the sun' or 'the land of the sons of Ar', which is literally 'the land of the sons of the sun'. A similar case is seen in the Armenian words Hayk' and Virk which by virtue of the plural- forming suffix k' mean, respectively, 'Armenians' and 'Georgians' and also 'the land of Armenians (Armenia)' and 'the land of Georgians (Georgia)'. Just as the name Arma-ni appears simply as Arma, without the suffix -ni, in the Alalakh inscriptions, so does it in the form Arme in the Assyrian and Urartian writtings. Since, as it was mentioned above, Ar-ma or Ar-me meant 'built by Ar' (the city or country of Ar), or 'the offspring (or the son) of Ar', and since Ar was also called Ara, it follows that the name Arme could have been pronounced also as Arame, which is, as we already know, the name of the founder of Urartian kingdom, meaning 'the son of the sun', and is preserved by Khorenantsi in the form Aram, as the name of one of the Armenian patriarchs. At this time there lived Semiramis (Shamiram in Armenian), the queen of Ninevah. Her husband was Ninus, who came to loathe her for her infidelity, and left his country. Semiramis, who had heard about the fame of the handsome Armenian king Ara, lusted after his image and asked him to come to Ninevah and marry her. When Ara refused, she marched her armies towards Armenia. The battle began when Semiramis arrived in the region called Ararat. She ordered her commanders to capture Ara alive, but he was vanquished and killed by one of her sons. His body was found on the battlefield among the other slain soldiers. In order to calm the Armenians, who wanted to continue the fight to avenge his death, Semiramis said, "I have prayed to the gods to lick his wounds and heal him. Ara will revive." Semiramis was a sorceress, and she believed in her powers. She was so crazed at his death and desperate for his beauty that she believed she could revive him. When his corpse decayed she became more crazed than before, and had her servants bury it in a deep grave. Dressing one of the men from her retinue of lovers as Ara, she came before the Armenians and said, "Licking his wounds the gods gave life back to Ara, thus fulfilling our deepest desires. Since they have bestowed on us happiness we should exalt them more than before." She had a new statue erected to the gods and offered them many sacrifices for saving Ara. The people believed that Ara was revived, and Semiramis was saved from another battle waged against her. In order to eternalize her love for Ara, she named his son Karthos after him, who was born from his wife Nuvard and aged twelve at the time. Although he was so young, she made him ruler of Armenia. On her way back to Ninevah, the proud Assyrian queen traveled by the eastern shores of Lake Van. Struck by the beauty of the region and bringing thousands of workers and many architects, she had a magnificent summer palace built on the rocky cliffs nearby. (Ed. Note: There is some discrepancy in Khorenatsi's account of the palace and city alluded to Semiramis. The description of the palace walls and a monumental wall with inscriptions described in his account were actually built during the reigns of the Urartian King Menuas and Argishti. Khorenatsi mistakes the palace and new city of Tushpa for one built by Semiramis. Likewise the Semiramis Canal, which was accredited by Khorenatsi as being built under Semiramis' orders, was laid during the Urartu period, on top of earlier 4th-3rd millennium BC canals). Khorenatsi goes on to relay that Semiramis remained in the city she had built, appointing as her representative in Assyria and Ninevah, Zoroaster, the religious leader and oracle of the Medes, and as such he ruled the country well for a long time. Ninus did not die in Ninevah, and is not buried in the palace, as it is said, but actually fled to Crete. When her children grew up they wanted to seize Semiramis' throne and confiscate her treasury. They openly accused her of disgraceful deeds. This enraged her, and she had all of her children killed with the exception of the youngest son Ninyas, or "Zamassias". She left her throne and her treasury to her lovers instead. Therein Zoroaster tried to usurp the throne, and in the ensuing battle Semiramis was defeated which caused her to flee to Armenia. Her son Ninyas saw his chance, and killing her became the ruler of the kingdom. Ara (Karthos, the renamed son of Ara) also died in during the battle, leaving a son named Anushavan. Another version of the story of Ara Geghetsik and Semiramis is tied to the mountain that bears Ara's name (Arai Lehr). This version has Ara being cast upon the mountain by Semiramis after he spurns her advances. Semiramis, skilled in black magic, conjured the forces of the night to throw him into the void, and when he landed, his body sank onto the top of the mount, giving it its present contour. Yet another tale says that when Ara died, and Semiramis had him buried at the foot of the mountain, his spirit rose, forming the top of the mountain into his sleeping likeness. The top of the mountain does resemble the contour of a man's face. All we need now is someone write an epic about Ara and Shamiram. Arahet, Aralez and Asht Arak.?? Volcano Arailer (Mt. Ara) intensively partitioned by erosion, rises above the northern part of the Yeghvard plateau and is separated from majestic Aragats by a canyon of the river Kasakh. Far from being the highest point of the Armenian volcanic uplands, Arailer has the richest history and it is tall in Armenian folklore. He is old, but still deserves his name: “Ara the Beautiful” – carved into grandeur by volcanic sculpting some 10 million (or so) years ago. Named for a revered deity of Armenian’s pagan age, Ara struck terror into Neocene-age mastodons, when the great mountain heaved flaming magma from its giant belly. With long fused tongues hanging out of its fire-spitting crater Arailer sometimes scoffed at the tertiary fauna, sometimes flirted with it. By the time the first humans appeared, Ara had mellowed and welcomed the new age to his domain. Having spent all his fiery heat on building material, Arailer was covered with bitter wormwood and fell asleep as it seemed forever. A god-fearing Armenian grain-grower revived the mountain by giving it a name . . .
A bright Sunday morning drive takes a turn near the village of Nor Yerznka near Ashtarak and rambles and rumbles to the bottom of the sleeping volcano. Five-star hotels hardly can draw the attention of foreign tourists. It is obvious that the moderate step of the pack animals seems to be more attractive, especially on that hillside valley which is impregnated with folklore and history. According to the Armenian tradition, it was here - at the bottom of Arailer – that the well-known battle between the Armenian king Ara the Beautiful and the Assyrian queen Shamiram (in the Greek version - Semiramis) who desired him, took place. It was in this field that the Armenian lord remaining faithful to his wife Nvard fell, and his bloodstained body by the order of Shamiram, a voluptuous widow of king Ninos, was placed in a rocky niche for the reviving lick of “aralez” – dog like mythologicial monsters whom ancient Armenians believed to have power to resurrect the dead by licking their wounds. Such a narration of a guide accompanying tourists sitting under the white umbrella on mules could give a special color to this field. The events of the remote past would revive in the imagination of everyone probably having filled nowadays a semi-desert panorama with historical sense. The rocky niche formed on the southern slope Ara Mountain has an area of about 20 square meters. It is, in fact, an original cave and is believed by some till now to have magic properties in its water. Locals call it “alive” and sometimes take its water when they leave. A trip to Ara grotto is a real pilgrimage. According to one tradition, it is this water that “licked” the pacified body placed under the vaults of the Cave of the Armenian king, and the zoomorphic relief of rock was thought of in the image of aralez dogs. For quite a long time in this niche sterile women had worshipped the god of dying and reviving nature – Ara. With the adoption of Christianity, the contents of the cave were adapted to the requirements of the new religion. The relic began to be called Tsaghkavank. The cave also has another name – St. Barbara – given by German scientists. What was believed to be “magic” water is now taken for its holiness. Ascension to a volcano is inspiring. Meter after meter you overcome half-forgotten pages of domestic history and from the earthly kingdom of Lord Ara the Beautiful slowly, but steadily move to the kingdom of the Divine Ara. The route runs through the marvelous gorge of a Belly Ripped Open (named so in honor of the wounded king): the mountain formed in Neocene in the consciousness of pagan Armenians symbolized a dualist nature of the single cult – earthly and divine. From the southern side, gray-haired Ararat looks down on us, from the West Ara’s Throne (Mt. Aragats) towers and at its foot there is a valley of “pacified Ara” – Asht Arak. The central place in religion of early agricultural societies was occupied by cults of dying and reviving deities, symbols of spring reproduction of natural forces and renewing of life. The fate of people standing at the sources of civilization directly depended on the whims of weather, which speaking properly, made them pray and rely on strictly agriculturally cults. Egypt had Osiris and Phoenicia had Adonis. Armenia had Ara. It has been shown by some Orientalists-Armenologists (and alos in our previous works) in a number of quotations of mythological and historical date that the native people of the Armenian Highland and the neighboring regions of Asia Minor had, in the earlier periods of paganism, a deity whom they called Ar or Ara. In the primitive hunting stage of the life of these natives, the god Ara possessed animal –vegetal characteristics. Later, with the beginning of agriculture, he acquired vegetal-solar nature and with the development of irrigation in agriculture and the consolidation of statehood, he became a great war-god and was identified with the sun. This process of change from primitive to complex characteristics, as manifested in the nature of Ar (or Ara), is by no means unique in the mythological history of mankind. It has had its close parallels. For example, the god Assur, in the earlier periods of the founding of the city of Assur, had a vegetal (peaceful) nature, but later on, when Assyria become a mighty empire by bloody expeditions, it turned into a fearsome deity and was identified with the sun. Research has revealed that in the remote past Ar (or Ara) was the principal national deity of the Armen people. We do not think it is necessary here to delve further into the nature of Ara, because we have already treated this topic at great length in our previous works and have shown with numerous evidence that Ara was the native and national deity of the Armenians. However, because of the importance it bears upon the subject under study, we think it will be helpful to mention here some facts related to the formation and the meaning of the national name Armani and Armenians which is closely linked to Ara. It is known in historiography and archaeology that the name of many ancient peoples have been related to the names of their principal deities. In the remote past. each tribe, even each household, had its own totem, its object of worship, or its god. With the increasing of the household or the tribe in size and in strength, its god has correspondingly acquired greater significance and power. We learn from cuneiform inscriptions that battles waged between tribes and states have been fought mostly for and in the name of the gods of the fighting sides. In many cases tribes and states were distinguished from each other by the names of the gods. In the same way have originated also the name of many habitations and countries. Because of intertribal wars, a given tribe was forced to fortify a central area on its territory where it kept its sacred totem in safety or established the throne (or the temple) of its god, from whom that particular place derived, subsequently, its name. Later on, as the tribe has grown and spread out, that fortified habitation has become an administrative and economic center, and still later the capital. Very often we read in cuneiform writings that a certain king has defeated the king of the land of certain city. We have seen statements of this kind in the well-known Hittite inscription about Naram-Sin, where among his 17 enemies there is one mentioned as “Madatina, the king of the land of the city of Armani.” This shows clearly that the country of a tribe or a state could have derived its name from the name of its central or royal city, which, in many cases, bore the name of the principal god of that particular tribe or people. This is how have originated, for example, the names of the great Assyrian and Roman empires, which were originally the name of the central cities, Assur and Rome, of the given tribes, and where each tribe had established own object of worship, Assur and Romulus, respectively. The same is true also about the Greeks who call themselves Hellenes and their country Hellada(Hellas) after the name of their god Hellenos. In view of all these considerations, one would expect that the name Armani or Armeni that represents one of the most ancient peoples and the tribal unions of Western Asia should have been derived from the name of the principal deity of that tribe or people. And indeed, as we have seen, the name of that principal national deity was Ar or Ara. We find that the word Ar-man-ni is a compound noun, where the first component Ar is none other than the name of the national sun-god of the Armens, and the second component MA ( me a variant) signifies, ‘build, make, beget, offspring, son’. Ma, with this meaning, was known to many peoples of the Near East in antiquity. The goddess of birth and fertility, so well known in Asia Minor, was called by this very same name MA. (Ma also occurs in its reduplicated form Mama (or Mami) in Assyro-Babylonian inscriptions). This root-word (and also its variant me) is found also in the Sumerian language with the same meaning. It results that Ar-ma (and its variant Ar-me) means ‘built by Ar born of Ar’ or ‘ Ar’s/ Ara’s son ‘ (‘the son of the sun, AREVORDI). The ending -NI of Arma-NI (or Arme-NI) as has been mentioned earlier, is a plural and toponymic suffix (cf. Mitanni, Supani, Alzini (Alzinini), Daiaeni, Nihani, etc.). Hence Armani (or Armeni) means ‘son of Ar’, that is, ‘sons of the sun’ or ‘the land of the sons of Ar’, which is literally ‘the land of the sons of the sun’. A similar case is seen in the Armenian words Hayk’ and Virk’ (Hayq, Virq) which, by virtue of the plural-forming suffix k’ ( f ) mean, respectively, “Armenians” and ‘Georgians’ and also ‘the land of Armeians (Armenia)’ and ‘the land of Georgians (Georgia)’. Just as the name Arma-ni appears simply as Arma, without the suffix -ni, in the Alalakh inscriptions, so does it in the form Arme in the Assyrian writings. Since, as it was mentioned above, Ar-ma or Ar-me meant ‘built by Ar’ (the city or country of Ar), or ‘the offspring (or the son) of Ar’, and since Ar was also called Ara, it follows that the name Arme could have been pronounced also as Arame, which is, as we already know, the name of the founder of the Urartian(Van/Ararat) kingdom, meaning ‘the son of the sun’, and is preserved by Khorenatsi in the form Aram, as the name of one of the Armenian patriarchs. It must be accepted, therefore, that the name Arma or Arme (Arame>Aram) was the basic component of the name Arman-ni or Armen-ni, and hence, it represented the name by which Armenians are commonly called by foreigners. This proves that Khorenatsi transmits some ancient and accurate information when, writing about Aram, he states that all the nations of the world call the Armenians Armen and their country Armenia after the name of Aram. Dukkama - The name of one of the cities of Armenia. Tarkuma - This place-name is mentioned by the Hittite king Mursil. Tarku-ma means “that which is built by the god Tarku (TORK, TORQ)”. Torkashen (Torqashen) in Armenian. Automa - The daughter of Tigran the Great, who was married to Mithradates II of Pontus. Artasama - The name of the daughter of King Artashes of Armenia who was married, according to Khorenatsi, to “ a certain Mithradates, the great prefect of the Georgians.” Artas-a-ma means ‘born of Artas (or Artashes)’. There are many more place- and personal names of antiquity in the Near East (including the Armenian Highland) and Asia Minor that carry the suffix -MA, bu the examples given above should be sufficient to show that -MA indeed meant, ‘built, begotten, offspring, son’, just as the ending -AZN, -ZUN, and –SEN in the Armenian language convey the same meaning in such compound nouns as Ark’ayazn (arqayazn, ‘king’s son). Haykazun( Haykazun, ‘Hayk’s offspring’) and Haykasen (Haykashen, ‘built by Hayk’). We shall still have opportunity to quote a series of place-names in the Armenian Highland that bear the component Ar or Ara. Suffice it here to mention just one direct testimony from a cuneiform inscription showing that the region of the land of Arme was actually called the land of Ar. Dzopk’ (Assyrain Isua, Hittite Isua, Latin Sophanenae) was situated in the northwestern region of Arme-Subria. It is evident that it was an Armenian Kingdom and her king Adrazar (Zariadr-es) was Armenian. We see that David, instead of specifying this king by his family name Armen, called him “the Son of Ara”, revealing thus his national identity. This is another concrete evidence supporting the fact that the name Armani(Armeni) means ‘sons of Ara’ or ‘the land of the sons of Ara’. Even after the adoption of Christianity where were still many places in Armenia where sectarians called “sons of the Sun” (“Arevordi”) continued to exist, and were strongly opposed by the Catholicos Nerses Shnorhali. The term “Arevordi” persisted in Armenia unti the 12th century of our era. Since in the remote past Ar (or Ara) was the main deity of the native peoples of the Armenian Highland and since these native peoples were generally called by the name of this god, it would naturally be expected that certain place-names would have been composed with the name of this deity or with the name of the people bearing this name. In fact, in antiquity, the entire Armenian Highland was replete with names that contained the component Ar or Ara. It is true that in later centuries the Armenian Highland, as a highway between continents, has been subjected to many foreign military, political, and cultural influences and has adopted other deities, resulting in many changes and in compounding of new place-names, even yielding to abliviion the identity of Ara: but still there are many place-names in the country that preserve the memory of Ar or Ara. Ինձ տանջող հարց կայ, բարձրացնեմ եւ յանձնեմ բոլորիդ. Johannes, indz mi aritov mi azri turq porcum er hamozel vor aysorva hayastan@ irenc(azerinneri) hogern en yegel. Yerb panjeci vor apacuci, asac vor nuynsik aysor hayer@ oktagirtsum en 'mahmedakan'(arden azerineric yan talov mahmedakan bar@ oktagortsec) barer. Ira aselov Alaverdin irenc allahi anunov a kochvum. Yerb harcir inch kasi Alabamai, kam Alamedai masin, apushe@ gerazances bolor spaseliqners u asac vor dranq el en mahmedakan barer. Arameaciner@, vor semakan dzakum unen, voch mi kap chunen Armenneri het. Isk Nemrut leran semakan anvanum unenalu masin nuynisk hark chem hamarum xosem. Irenc aselov nuynisk Mher anun@ uni semakan dzakum. Bavakanin tvov rabiner kan vor qo nsiats tartsqner@ hamarum en irenc srbavayr@. Nerkayis, hreanner@ bavakanin mets tartsqner en arel turqakan karavarutyunic. Sa mi kegtsiq a iranc kogmic taratsvats vori armatnerum tagnvats e nayev hayoc cagaspanutyan harc@. Asorineri hayakan dicaraov nshelu harc@ aydqan le chhaskaca. Da qo kogmic yentadrutyun er...te vorpes past eir nerkayacnum? As we see, the first quotation tells us that Hayk, the god (ancestor) of Armenians, called that particular tableland Hark by his own name, or that it was named after him; and the second quotation testifies that the sons of Hayk, that is, the Armenians, “the sons of Ar” (the Armens), were living there. The initial ‘h’ of the name Hark’ seems to be an added intensifying sound as it is used in the Armenian language. Compare: Rome>Hrom, Arma>Harma, Aramayis>Haramayis, aganel>hagnel, etc. Hark’ is basically ark’ (arq), which means ‘the Ars’ (with the plural suffix k’) or ‘the Armens’ and also ‘the land of the Ars’. The equivalence of Hark’ and Ark’ is also proved by cuneiform testimony, like the inscription of king Menua, found near Mush, in which, as mentioned earlier, that particular region is called the Ar-hi(‘Ar-ian/Aryan’) land, implying that that region of Mush bordering of Hark’ was, in fact, the continuation of Hark’ as Ar-ian/Ar-yan land. (The event recorded by Khorantsi is transmitted by G. Srvantztiants in this way: “The king of the Armenians killed Bel with the hand of God and took the body to the summit of NEMRUT, where he built a fireplace, hanged the body in it and burned it.” As we can see, where Srvantztiants has “NEMRUT”, Khorenatsi has “a high plateau in Hark’ “, leading us to the conclusion that Hark’ extended even to Nemrut, thus including the Mush valley and its regions. It becomes clear, therefore, that Hark’ was Ark’ or Ar-ian/Ar-yan (Ar-hi) land). 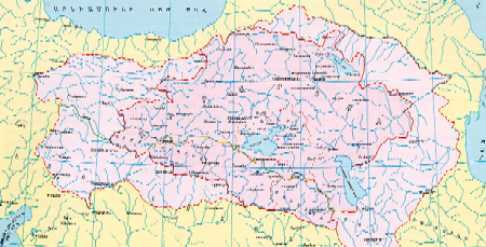 The river that passes above Lake Van and through the entire central region of Armenia is called Arasani (pronounced Arsania by the Assyrians). Academician Ghapantsian, in his book The Cult of Ara the Beatiful, shows conclusively that Arasani means ‘the river of Ara’. It is known that the southwestern region of Armenia (the region of Nairian land called Subria) was also called Arme (or Urme) by the Assyrian kings, meaning ‘the land of the offspring of Ar’. Because of it unique geographical position, this region has maintained its identity by not joining, or not being able to join, the Urartian union formed by the other Nairian co-tribes and has preserves its autonomy in spite of the active efforts exerted by the Urartian kings forcing it to unite with Biaina in the face of Assyrian obstructions. The same situation continued even after the fall of the Urartian kingdom, when the kings of the Artashessian dynasty also tried hard to unite the Armenian kingdom of this same region (later called Dzork’) to the Greater Hayk’, this time against the Roman interventions. Tiglath-Pileser I calls the region south of Lake Van Haria, in the neighborhood of Kutmuhi, where he has fought against 25 cities located at the outskirts of its eight mountains. This implies that Haria was vast land. Har-ia means ‘land of Har’, in other words, Hark’. The conclusion is that this too was a ‘land of Ars’. The Armenian feudal province (nakhararutyun) in the east of Lake Van was called Arsruni. This name is derived from Arsruniuni, mentioned in Urartian inscriptions, which was the name of the city near the southern tip of Lake Arcak and that of a Nairian tribe that lived in the area. In the language of Urartian inscriptions, sue(suini) means ‘lake’. The Armenian word sov(dzov) is related to it. Ar-suni-uni meant, therefore, ‘the people of Lake Ar” (Ar-ljeci-ner’) or ‘the land of a Lake Ar’(Ar-lji-yerkir’). One could think that this was name after Lake Arcak. It is possible in this case to assume tha the term Arcak is formed by adding the suffix -ak to Ar-sue (that is, Ar-sue-ak>Arsak>Arcak). The northeastern region of Lake Van was known in antiquity by the name Arberani. As it was pointed out earlier in connection with the meaning of the word ber(a variant of bir, signifying “race’ or ‘house’). Academician Ghapantsian has shown with great accuracy that Ar-ber-ani meant the ‘Ar-tribes’. Therfore this region also belonged to the Ar people. The region north of Lake Van was called Aramali by Shalmaneser III. As mentioned above, this name was also pronounced (by Sargon II) as Armarili (Arma-ri-li) where the infix -ri is inserted between the root-word Arma and the plural-forming siffix -li, as Su-ri-li, mentioned in the inscription of Argisti II near Arces. The -li ending the word Ar-ma-ni or Ar-me-ni, hence the anem Ar-ma-li coincides with the name Ar-ma-ni (or Ar-me-ni). It is to be noted that the three components of the name Ara-ma-li is also correspond in meaning to those of Ar-ber-ani, the name of the same or a neighboring region, in the following way: Ara=Ar (the divine name), ma (‘offspring’) = ber (‘tribe, race’), and li=ani (as plural-forming and toponymic suffixes). This is further proof that the ma component of Ar-ma-ni means ‘offspring, son’ and tha the full name Ar-ma-ni (or Ar-me-ni) signifies ‘born of Ara’ sons of Ar’, or ‘the land of the sons of Ar’. These considerations clearly show that the name Armani (= Armeni) and Aramali(=Arberani)… (The Ar-ber-ani region has also been called Aya-du, instead of Ara-du, where –du is a toponymic suffix. Therefore, the Ar tribe has also been called Ay or Hay (with the initial intensifier h, as in Ark-Hark, Arma-Harma, Rom-Hrom, etc); hence Hark’ could have similarly been pronounced as Hayk)… designate the same people that was in existence in this central region of Armenia even in the times of Shelmanesar III (859-824 B.C.) and Urartu. This must also be accepted as proof that the name Armani was linked with the name Armeni( THAT IS NOT SEMITIC) and that it belonged to the people called Armens (the sons of Ar). In the times of Urartu the region of Shirak was called Eriahi(Eri-ian). Let us mention here, by way of parenthesis, that in ancient Armenian, certain words beginning with ar- had also heir parallels beginning with er- . It is accepted in linguistics that replacing ar- by er- is merely a dialectal difference. We already know from the works of Plato that in Pamphylia Ara was called Er(the son of Armenios). It is also known tha the personal name Arameneak or Aramenak, derived from the ethnic or place-name Armani(Armeni), is rendered Erimena in its Urartian form. It seems certain, therefore, that Eri component of the name Eri-ahi was a dialectal variant of the name Ara. Hence the conclusion, that the tribal or place-name Eriahi(Eri-ian), the land-name Ar-hi(Ar-ian/Ar-yan) mentioned by Menua, and the Armin (Armenian) personal name Araha (Ara-ian) mentioned by Darius are all homonymous and identical terms, all linked to the name of the god Ar(Ara) or to that of his people, likewise called Ar(Armen or Armin). There must also be a connection between the name Eriahi (‘Ara-ian’) and the name of the river Erash, pronounced Araks as well. As we see, the names of the Arasani and the Araks rivers are linked with the name Ara of the national god of Armenians and/or with the name Ar(Armen, ‘sons of Ar’) of his people. These two rivers that together from a line extending from the west to the east (from the Euphrates to the Caspian Sea), underline and embrace wholly the land called Armenia and they have, for millenniums, constituted the national sacred rivers of the Armenian people that have begotten and nourished them. They are to the Armenian people just what the Indus and the Ganges are to the Indians, the Nile to the Egyptians, and the Euphrates and the Tigris to the ancient people of Mesopotamia. In the northeast of Lake Urmia there was the Arhu(‘Ar-ian’ or ‘belonging or the Ars’) land. The direct name Arevik’ (‘the Sun people’) mentioned in ancient Armenian literature possibly preserves the memory of this tribe Arhu and its land. All these illustrations show that it was not only Hark’, the central region of Armenia, that was called by the name of Ar(or the Ars), but Lake Van, the hart of Urartu/Ararat/Ayrarat, was entirely surrounded by the Arasani river, the lands of Arhi, Arme, and Haria, the Arcak lake, the habitation of the tribe Arsuniuni, and the lands of Arberani and Aramali; all linked with the name of Ar(Ara) or that of his people Ars. As we have seen, other than in in the surroundings of Lake Van, there were also many other regions in the north and the northeast of the lake where the sons of Ara(the Ar people) have been living and have left their traces, such as, the Eriahi land, the Erash(Araks) river, Mount Aragadz, the land of Aria(Ar-ia) and the district of Arhu(or Arevik). And these are not all. Scattered throughout the entire expanse of Armenia there are numerous places- and tribal names that are derived from the root-word Ar or Ara (and their variants Er or Eri), many of which must have been related to the name of the god Ar(or Ara). Among these are mountains, such as, Er(in Vanand), Eritia( in the Dzaghkants range, mentioned by Shalmaneser III), the Mountain of Ara(to the east of Aragadz). Arazin (in Daralageaz), Aruni and Arua (in the land of Tumme and in Hari, respectively, both mentioned by Ashurnasirpal II); place names such as Arura and Arube (cities in the land of Tumme), the Village of Ara (at the foot of the Mountain of Ara), Arahez (in Tayk’), Arahudz (in Sunik), Argec(mentioned in the inscriptions of the Marmashen Church dated 1029 A.D.) Arazu, Armuria (fortresses in the Ulhu-Hoy region), Arna and Arbu (cities in Aramali), Erinu (district in the south of Lake Van) Eriza (Erizinjan), Eridia[ni] (a city mentioned on the Gate of Mher), etc. We should point out that among the above we have omitted to mention those place-names formed with Ar that lie in the regions extending from the Euphrates to Mount Argaeus (Erciyas), which, too, have been dwelling sites of Armenians in the past. In the light of all these, the term Armi, mentioned in the Eble inscriptions becomes more understandable. We have seen that Armani was in Subartu and that Arma-rili was also called Su-rili, which means that the Arma(=Arma[-ni]) people were also known by the name Su(=Subari), just as the land of Arme was also called Subre. The Eble inscriptions revealed that Subarians lived both in Eble and in the surrounding regions, evidenced by the facts that there were a governor and a master in Eble bearing the Subarian names Subur and Guzuzi, respectively, and that there were a king called Ar-Ennum, a governor called Irkab-Ar (cf. Irkab-Dumu) and an inspector called Dada-Ar, all names carrying the component Ar. In Eble were also worshiped the Subarian (considered Hurrian) gods Adamma, Habat, Ishara, and Astabi(the Astupinu of the Subarians). These and a series of other data suggest that the term Armi mentioned in the Eble inscriptions probably represnts those Subarinas who were called Arma(or Ar). There is already a reference there to a city by the name Ara. …Considering that in the same Ebla inscriptions are mentioned both forms Armi and uru, and also the plural of the latter, uru uru, it follows that the term Armi must have a meaning other than that of uru. Armi, as a common noun, meant ‘place of Ars’ , that is, ‘the dwelling place of the Ar people’ and ‘ the term Armi meant ‘the dwelling place of the Ars’ or ‘the cities of the Ar people’. 1. Yes @ndhunum em Nemruti Shumerakan* verdzanum@. The Kingdom of Urartu: 810-714 B.C. It must be accepted, therefore, that the name Arma or Arme (Arame>Aram) was the basic component of the name Arma-ni or Arme-ni, and hence, itrepresented the name by which Armenians are commonly called by foreigners. This proves that Khorenantsi transmits some ancient and slmost accurate information when, writting about Aram, he states that all the nations of the world call the Armenians -Armen- and their country -Armenia- after the name Aram. In order to illustrate the meaning of the component -ma- in the name Ar-ma, signifying 'built, begottern, offspring' or 'the son', we cite below, for comparison, a few examples among many drawn from ancient inscriptions: Astatama-The name of one of the kings of Mitanni. Dukkama-The name of one of the cities of ancient Armenia. Tarkuma-This place-name is mentioned by the Hittite king Mursil. Tarku-ma means "that which is built by the god Tarku (Tork-one of the sons of Hayk Nahabed). "Torkashen" in Armenian. Automa-The daughter of Tigran the Great, who was married to Mithradates 2 of Pontus. Artasama-The name of the daughter of King Artashes of Armenia who was married, according to Khorenantsi, to "a certain Mithradates, the great prefect of the Georgians." Artas-a-ma means 'born of Artas (or Artashes). There are many more place-and personal names of antiquity in the Near East (including the Armenian Highland) and Asia Minor that carry the suffix -ma, but the examples given above should be sufficient to show that -ma indeed meant 'built, begotten, offspring, son', just as the endings -azn, -zun, and -sen in the Armenian language convey the same meanings in such compound nouns as Ark'ayazn (king's son), Haykazun (Hayk's offspring), and Haykashen (built by Hayk). We shall still have opportunity to quote a series of place-names in the Armenian Highland that bear the component Ar or Ara. Suffice it here to mention just one direct testimony from a cuneiform inscription showing that the region of the land Arme was actually called the land of Ar. The monument of King Menua of Urartu, found near Mush, is covered with inscriptions on all its four sides. In one of them the King has written that he had invaded the land of Urme (=Arme) and that there, in the Ar-hi ('Ar-ian' or 'Ara-ian')land, he had left an inscription. Here is the translation of that portion of the inscription that interests us: " City of Ataune, I came forth (to invade) against the land of Urme, I conquered the land of Urme, I erected this inscription in the Ar-hi land..."
This Arhi ('Arian' or 'Araian') region was in the southeast of Mush and lay in the land of Arme belonged to Ar (or Ara) and that it meant 'born of Ar', or 'built by Ara'. In ancient cuneiform writings sometimes we find statements where a certain king or a famous personality is considered to be the son of his main national god or the son of his nation.Josephus Flavius has preserved a direct and living historical testimony according to which King Adrazar of Dzopk' was called the son of Ara, instead of being identified by his national name Armen. H. Matikian, refering to J.Flavius' same testimony writes the following: "...the Jewish chronicler, after relating how David was expanding the boundaries of his kingdom with various invasions, adds the following words which are of great importance for us: 'And while he levied yearly taxes on them, he immediately moved against King Adrazar if Dzopk', the Son of Ara, and warred with him beside the Euphrates...'' 'Dzopk' (Assyrian Isua, Hittite Isua, Urartian Supani, Latin Sophanenae) was situated in the northwestern region of Arme-Subria. It is evident that it was an Armenian kingdom and her king Adrazar (Zariadr-es) was Armenian.We see that David, instead of specifying this king by his family name Armen, calls him "the Son of Ara", revealing thus his national identity.This is another concrete evidence supporting the fact that the name Armani (Armeni) means 'sons of Ara', or 'the land of the sons of Ara'. Even after the adoption of Christianity there were still many places in Armenia where secterians called "sons of the Sun" ('Arevordi,) continued to exist, and were strongly opposed by the Catholicos Nerses Shnorhali. The term "Arevordi" persisted in Armenia until 12th centuary of our era. Since in the remote past Ar (or Ara) was the main deity of the native people of the Armenian Highland and since these native people were generally called by the name of this god, it would naturally be expected that certain place names would have been composed with the name of this deity or with the name of the people bearing this name. In fact, in antiquity, the entire Armenian Higland was replete with names that contained the component Ar or Ara. It is true that in later centuries the Armenian Highland, as a highway between continents, has been subjected to many foreign military, political,and cultural influences and has adopted other deities, even yielding to oblivion the identity of Ara; but still there are many place-names in the country that preserve the memory of Ar or Ara. Edited by Ashot, 28 February 2008 - 11:55 PM. Johannes jan, qo harcin masamb ei patasxanel qanzi chi uzum ArmaniKingdom sit@ baceluc araj shat informacia durs tognem. Kavoukjian@ iren gortsum parz bacatrum e vor mer imacats semetakan arameaciner@ bnik arameacinneri het bacarapes voch mi kap chunen. It would be appropriate here to clear a misunderstanding in connection with the name Arma and Arime that causes some confusion in historiography. In the early stages of critical historiography in 19th century, the idea was advanced that the terms Arma or Aram, and Arime or Arme are Semitic and pertain to the Semites. I. Diakonoff, makes the supposition that the name Armina ( Armini-Armeni) is given to Armenian and the Armenians because of their neighborhood to the Aramaeans in the southern region of Hayk. As we can see, these nomadic newcomers called Ahlami have already become Hittites’ allies, but still they are called by their original name, Ahlami, that is, they are not yet called Aramaeans. Bit-Zamani( Diyarbekir region) represents the farthest penetration to the north of these Semites. Here it is clearly seen that Arma, with its determinative Kur, is a land-name, and not an ethnic designation; Ahlami is the name of the tribe that became the inhabitants of Arma. We see the same picture in the time of Adad-Nirari II (911-891 B.C.) when these Semitic tribes, having already settled in the land, have now added the term Aramaean to their tribal name Ahlami. Furthermore, the term Ahlami Aramaeans shows that at that time there were also non-Ahlami Aramaeans. As we have seen above, the information we obtain from the inscription of Adad-Nirari II speaking about a few of his invasions to the land of Arime shows that in his time the name Arime was a geographical term designating large expanses of land. Under this name were grouped the mountainous regions of the North as well as the plains of the South, all belonging to the land of Subari and the state of Mitanni. The main central regions of the state of Mitanni were in the mountain belt in the North, and this region was known earlier by the name Arma ( Arma-ni ) . The names Arma and Aram are derived from the same root with which are connected the later forms: Arim, Arime, Arme, Urme, and others. Thanks for the clarification. I guess after, the Assyria itself, inhabited by those ahlamies, and the Syriac language (Aramaic) became the common language of all.